Photographer Charlie Phillips moved to London from Jamaica in 1956 and began to document life in his local community. His photographs of people and places associated with Notting Hill depict both significant and everyday moments in the area’s history, particularly in relation to its growing black population. 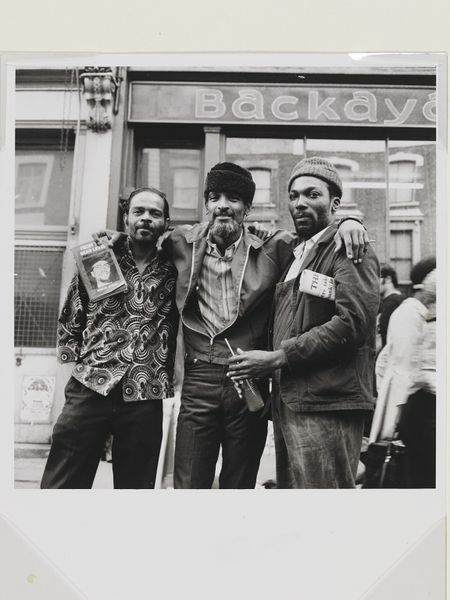 Phillips recorded visitors to Notting Hill such as the African-American Allen Donaldson, better known as Hakim Jamal (1931-1973), a controversial figure in black activism photographed at the centre of this group. Jamal displays a copy of his autobiography, From the Dead Level: Malcolm X and Me (1971), which focused on his association with the African American civil rights activist Malcolm Little or Malcolm X (1925-1965), whose cousin he had married. Jamal had been involved with a wide range of black activist movements before moving to London in the late 1960s when he became associated with the British Black Power revolutionary Michael de Freitas, who called himself Michael X (1933-1975). Jamal and his girlfriend Gale Benson, the daughter of a British M.P., followed Michael X to a commune he had set up in Trinidad where Benson was murdered in 1972. The controversy surrounding these events and the roles played by Michael X and Hakim Jamal were explored in an essay by the British Trinidadian writer V.S. Naipul and were said to have informed his novel Guerillas (1975). The V&A acquired ten photographs by Charlie Phillips as part of the Staying Power project. Staying Power is a five year partnership between the V&A and Black Cultural Archives. The project aims to explore black British experience from the 1950s to the 1990s through photographs acquired by the V&A and oral histories conducted by Black Cultural Archives. 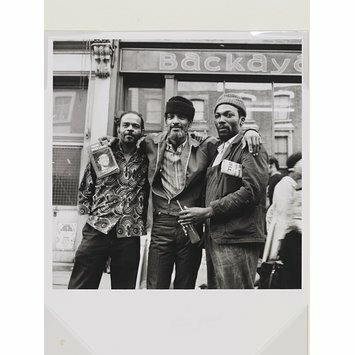 As part of Staying Power, the V&A also acquired a photograph by Al Vandenberg which depicts The Black People’s Information Centre operating at the same Portobello Road premises in the background of this photograph by Phillips. A photograph by Dennis Morris which documents Michael X’s London-based Black Power commune the Black House was acquired through the project as well. A black and white photograph shot from a low angle of three black men facing the camera, standing in front of a shopfront with a sign that reads 'Backaya' (the sign is cut off). The central man has his arms around the other two. In his right hand he holds a book, the title of which is ‘Malcom X and Me by Hakim Jamal’. The man to the right holds a bottle with a straw in it.